I was thrilled to be going to the Olympics in Vancouver but in all honesty I was not overly excited about all the events we were going to. I would have loved to see some skiing, after all I never did achieve my Olympic skiing dreams it would have be nice to see someone fulfill their dream for gold. You can see off in the distance where the snowline is on the Mountains. Our first event was curling. This was the event I was least excited about. My friend Jen, who I was attending the Olympics with, was delighted with attending the event! Why you may ask? Because we were in Canada and no one does curling better than Canadians. We got tickets to a women’s curling qualifying heat. The sport was easy to follow as it is similar to shuffleboard and although I am not 80 years old I have played my fair share of tabletop shuffleboard in bars before! It was quite impressive to watch the “curler” elegantly glide across the ice with one leg bent in front of her and one leg extended behind her as she coasted down the ice alley. It looked quite uncomfortable even if it was slightly captivating. After the curler releases the stone, two of her team members, or “sweepers” take brooms, manipulating the path of the stone to the other end of the ice. The object is to get the stone into the center of the “house”, or what looks like a bullseye. Another tactic is that if your opponent’s stone is in a better position than your position you can use your stone to knock their stone out of the bullseye to gain a better position or more points. There was a lot of shouting, positive of course, between the team members as they worked their way down the ice. I did not really follow the points system but the Canadians advanced and eventually ended up with the silver being beat by Sweden in the finals. Our second event was speed skating. Everyone was all about Apolo Ohno at this Olympics, including my co-workers. Even after I told them I would not be watching the short track super star as I was attending the 1500 meter long track event they were still stuck on Ohno. They guy has fans! Me proudly displaying my Maple Leaf Red Knit Gloves! We arrived at the skating rink with some time to spare, so why not get our photos taken with the creepy mascots? I do not know who designs these mascots but they are always slightly strange-looking. Although nothing can be as weird as the one eyed creepster London had for the 2012 Olympics. Do not even try to explain it London – it is still strange to this day. London Olympics Mascot. WTF is that? Anyways – back to the speed skating. This would be our only final event. Meaning we were going to watch the medals be awarded at the end of the race. We even had representation from the USA to root for in the field, Shani Davis. There was a whole group of Netherlands fans all wearing the same outfit as the man in the orange stocking cap. A prideful group supporting their team! The Netherlands fans were out in full force and certainly made the presence known in the crowd, which paid off as the Netherlands beat out Davis of the United States for gold by 0.53 tenths of a second… It was a devastatingly short amount of time difference between gold and silver and reminded me of Jerry Seinfeld’s take on the athletes who win the silver;”congratulations… you almost won”. But Davis shouldn’t have felt too bad about his silver, he did leave Vancouver with quite a bit of hardware as he also won the gold in the 1000 meter in addition to his silver he won for the 1500 meter. Our last event was hockey. I have attended several local junior league hockey games in nearby towns to where I live but I have never attended an NHL hockey game. 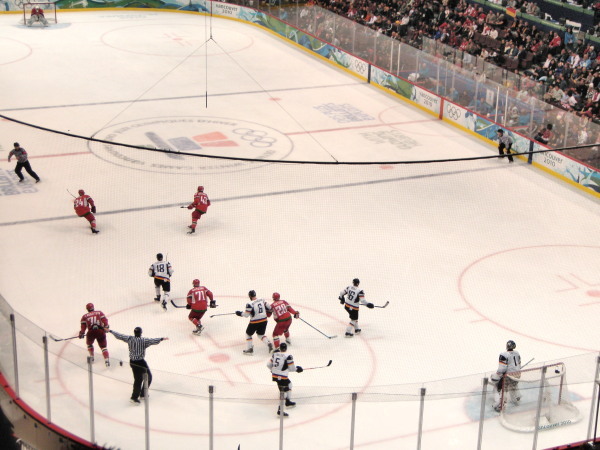 The Olympic Hockey events were being played at the NHL Vancouver Canucks arena. To say I was blown away by the sheer magnitude of the arena’s size was a bit of an understatement. My arena back home holds around 12,000 spectators where as this arena holds almost 19,000… the difference in capacity is about the size of the town I live in. YIKES! After we found our nosebleed seats we were ready for some hockey between Germany and Belarus. The room’s excitement was electric with hockey fans. The hockey teams skated out onto the ice, warmed up a bit and then got down to business. Although we were up high in the arena I could tell that these players were moving quicker and with more precision than the junior players from my home hockey team. Granted these players probably had a few more years of practice under their belts but there was a clear difference. As the game proceeded we watched with glee as we soaked up our last Olympic adventure. During the game a puck hit and broke the glass protector. Even the maintenance team moved quicker than what we had seen before. A few years prior Jen and I had attended a junior hockey game in Cranbrook Canada and had front row seats. A puck bounced off the glass and broke the glass right in front of us. Luckily no one was hurt but it took almost 45 minutes to repair. At the Olympics, maybe 20 minutes and the game was back in full force. The game ended with Germany getting 3 goals and Belarus 5. Although neither Germany nor Belarus made it to the finals we were still satisfied with our game and got to watch a bit of Olympic history. It would have been awesome to see the USA VS Canada duke it out for the gold but ticket prices were outrageous for our small town girl budgets. Canada beat the USA in a 3 / 2 overtime victory. Belarus skating for the win! We filed out of the arena and our Olympic adventure had come to an end. It was disheartening that we had to leave so soon. I had spent so many years dreaming of going to the Olympics but at least I was able to partake in some of the festivities and experience them as much as I did! Have you ever been to the Olympics? What events are your favorite? Tagged going to the Olympics, Olympic events. Bookmark the permalink.